These peanut butter bars are from The Cake Mix Doctor cookbook. They come together quickly (done in under an hour) and are - quite simply - AMAZING! Preheat oven to 325* and set aside 13x9 inch pan. Place cake mix, peanut butter, melted butter, and eggs in mixing bowl and beat. Mixture will be thick. Reserve 1 1/2 cups for topping. Transfer the remaining to the pan and use fingertips to press crust evenly over pan until it reaches all sides. Place chocolate chips, condensed milk, and 2 tbsp. butter in saucepan over low heat (I just did this step in the microwave). Stir and cook until chocolate is melted and combined. Remove from heat and mix in coconut, pecans, and vanilla. Pour over crust and spread to sides of pan. Crumble reserved crust and scatter over the top. Bake 20-25 minutes. 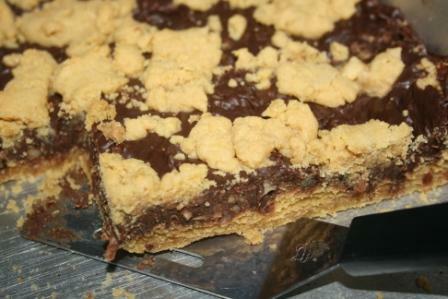 Remove and allow to cool 30 minutes before cutting into bars. I am so glad I ate breakfast before reading this post. I would have wanted these wonderful gooey treats for breakfast. This sounds to die for...seriously..wow! YUM! Thanks for the recipe :) Much appreciated!! I might have to make these for Michael, skipping the coconut. Thank you for the recipe! I'll bet this makes your home smell sooooo good! YUM!!!! I really should do some baking this weekend! Ok, I'm really drooling right now, except I'd leave out the nuts, because I hate nuts...but this looks DELICIOUS!! 'then run a half marathon to burn off the 10,000 calories...'LOL. You're gonna make me sooooo fat! I have that cookbook and love it! Your photo makes me want to take a big bite out of the screen!!! Very nice! My two favorite things...PB and chocolate. These sound so good. I know I can't make these - I'd eat it all before it cooled. no carbs in these right? Those sound incredible...minus the coconut because I'm not a fan but still...yum!!! :) Thanks for sharing!!! Just give me the peanut butter... I'll leave the chocolate to others... I absolutely love anything peanut butter! I tried to make it today - didn't turn out exactly the same - could be I didn't have the can of sweetened condensed milk.